Have you ever worn a nursing bra? Most of them look more comfortable than they actually are, and the function isn't quite what you need it to be. If you've nursed then you know your breasts are much heavier than they normally are. The thin straps most bras have feel like they're cutting into your shoulders with the extra weight of your breasts. Your back hurts from carrying them around too. I received the Best Treat For New Mommies - Nursing Bra to try out. This nursing bra is so comfortable and has a lot of stretch (actually stretches 3 cup sizes) and has nice wide shoulder straps, so they don't cut into your shoulders but distribute the weight evenly so your back doesn't hurt. The clips at the top of the cup area open easily one-handed so you can hold your baby and open the nursing area at the same time. I really like that the cup opens up a wide area so that the baby can nurse comfortably, making feeding time easier on mom and baby both. There's nothing more frustrating than struggling to open a nursing bra and holding a crying hungry baby. That situation can be a thing of the past. Happier baby means happier mom. This nursing bra is so comfortable it can be worn both during the day and to sleep in. No underwire but still offers great support. The bottom strap is also wide and very comfortable. Just an all around great nursing bra that can be worn during pregnancy as well. 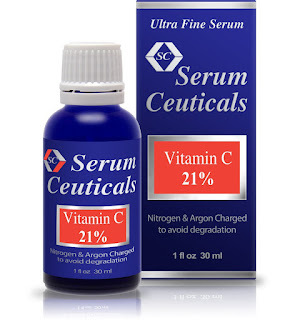 I also received Vitamin C 21% Facial Serum to try. I take Vitamin C supplements orally and thought that was doing a good job of keeping me healthy and hoping it would do the wonderful things for me skin that I have read Vitamin C can do. I didn't know that using it topically is 20% more effective than taking it orally when it comes to your skin. This serum help reduce fine lines, even skin tone, lighten age spots, and fights acne. WOW!!! Plus there are no preservatives, just lots of age defying Vitamin C.